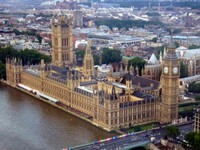 The houses of Parliament in London is the place where members of Parliament gather to make laws. 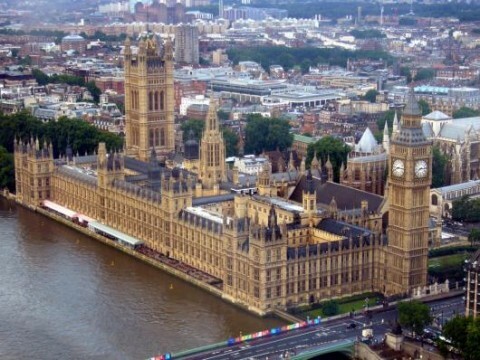 The Palace of Westminster stands on the riverside near Westminster Abbey. Tourists who visit the Houses of Parliament may sit in the Strangers’ Gallery looking down into the Houses of Commons and listen to the debates. All the time Parliament is in session, a flag can be seen over the building. When the House of Commons is still sitting after dark, there is a light over the face of Big Ben. The members of the House of Commons sit on two sides of the hall. The Speaker is the chairperson at all the debates in the House of Commons, and it is duty to keep order. The Speaker is elected by all the members of the House of Commons. He belongs to one of the political parties in Parliament. He never votes. The chairperson of the House of Lords is Lord Chancellor. He sits on the Woolsack, a large bag of wool covered with red cloth. It shows that wool made England rich. Where is the Houses of Parliament? May tourists listen to the debates? Who is the chairperson of the Houses of Commons? Who is the chairperson of the Houses of Lords? Why does the Chancellor sit on the Woolsack?